It seems like several months since we last saw a Brighton side in action on the derby track, although in truth the London tattoo show tournament was just a few weeks ago. This Saturday afternoon (13th July) the setting is probably as far removed from the urban jungle of North London as you’ll find in UK derby. Set your sat navs for half a mile south of the village of Ashby Parva (population 211) in the depths of the Leicestershire countryside. Indeed, the meandering bus journey from central Leicester takes as long as the train from London (tip: you can swerve half the bus trip by hopping a train to Narborough). 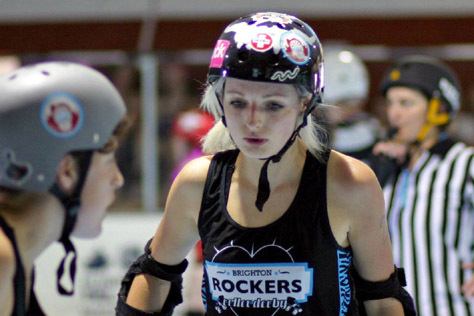 This bout sees a return meeting between the Brighton Rockers and Dolly Rockit Rollers. 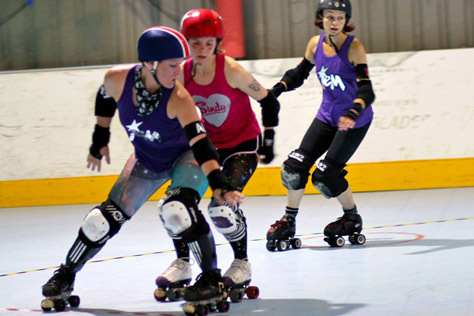 When these leagues faced off in a diamond jubilee themed bout at Haywards Heath last May, the Rockers A-team rolled out comfortable winners with a final score of 224-69. It’s their B-team Bruisers taking part this time out though, in what marks only their second public bout (first outside of Sussex). Given that Brighton have a much smaller roster than most leagues of a similar stature, their B-team often looks an awful lot like the A-team minus most of the jamming rotation. Whatever form the Bruisers squad of [up to] fourteen takes, many people are expecting this to be a close one. 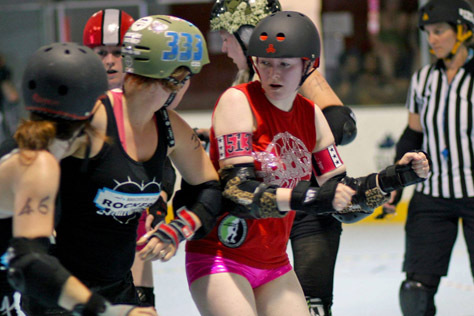 Since last year’s match-up, the Dollies have gone through a period of transition. Talismanic Rogue Runner moved away and now destroys the best of Europe and North America in the pink and black of London Brawling, and there have been a number of other additions and subtractions of personnel. The Leicester league have certainly been keeping busy though, having fitted in an impressive total of thirteen bouts (an average of one per month) since their appearance in Sussex. We’ll gloss over the specific results – they won one and a few others were quite close – and move on to how this calendar compares to Brighton’s. 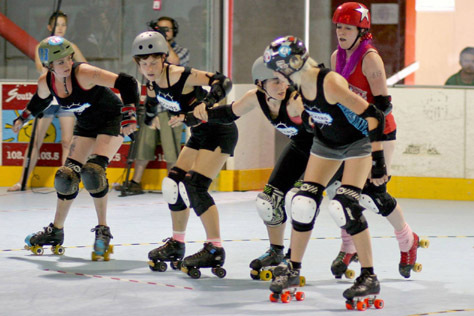 The Rockers A-team have played eight bouts since their previous meeting with the Dollies, with three of those contests being at the recent tournament in London. These eight matches resulted in four wins and four losses, with the latter being something of a new experience to the Rockers. 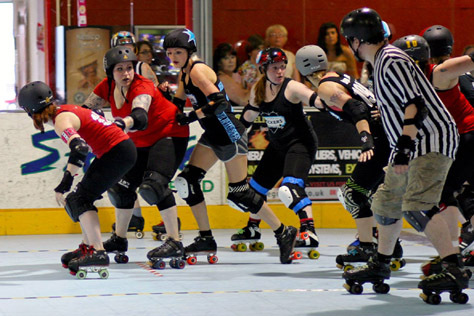 Indeed, last year’s bout against the Dollies was the last match of a long unbeaten run that stretched right back to the Brighton league’s foundation! We should be focusing more on their B-team results here, of course, but there’s not a great deal of them to focus on, with a narrow 191-246 home defeat in March to the fast rising Portsmouth league the only open door result to speak of. 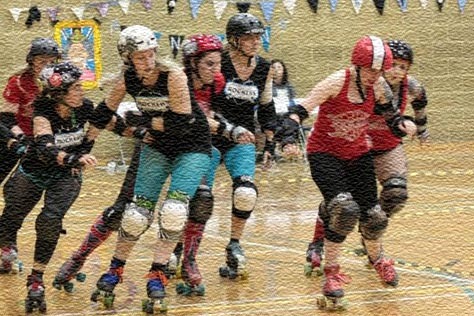 The use of a squad of twenty in the London tournament will have provided useful experience for many of the non A-team Bruisers though. So how’s it all going to play out? The only way to find out is to add a sunny Saturday in the East Midlands countryside to your diaries. Tickets are only £6 online (£7 on the door). We’ve spoken to a few folk from the Leicester and Brighton ranks about what people travelling up for the bout can expect. With Brighton’s A-team currently ranked 9th in the UK and the Dollies 24th, these two sides should be pretty evenly matched. Train travel from Brighton to Leicester (via St Pancras) is about £50 there and back if you buy advance singles for designated trains each way. Hotels are mostly £50-£60 a night, but with less than three hours journey time from Sussex you’ll probably only need to stay over if you can’t bear to leave an afterparty in progress. We’ll hopefully be putting up a bout report a few days afterwards, but since our reports are largely stylised gibberish the only way to really know what went down is to get yourself up there!